Scores of jobs are under threat after a chemical giant announced plans to close its site in a town after 61 years. DowDuPont, formerly Dow Chemical, employs 65 people at its King's Lynn agri-science plant, but said it intended to shut it by August 2019. The firm said it was relocating some of its operations following a merger and an employee consultation for the King's Lynn agricultural division had begun. North West Norfolk's Conservative MP said the move was a "bitter blow". In a statement, DowDuPont said it hoped to redeploy workers from its King's Lynn's crop protection operations to other parts of the company. "A strategic assessment has been under way to address certain duplicative sites and facilities and to relocate certain capabilities," it said. "One of these difficult decisions was to discontinue operations at the King's Lynn... facility." Constituency MP Sir Henry Bellingham said he had requested an "urgent meeting" with the US-based firm's agri-business country manager to look at possible actions to save the 65 jobs. "It is certainly an end of an era for Dows in King's Lynn and a bitter blow for the employees and their families," said Sir Henry. "Products there such as Dursban and Reldan are world beaters used by farmers all around the world, nevertheless the new combined company have much bigger sites elsewhere in Europe. "I will be seeking assurances that all of the affected staff will be offered jobs across the DowDuPont business." Sir Henry said he believed a review of Dow's operations, after last year's merger with DuPont, showed the King's Lynn plant was operating "below capacity". The MP said he had been told the firm's Styrofoam division in the town would continue to operate as it had been sold to a European company. 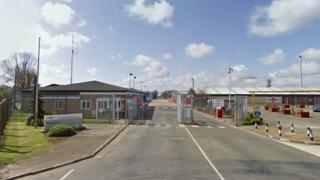 Despite the site's looming closure, DowDuPont said it remained "committed to the UK and Ireland" through its facilities in Cambridge, Abingdon in Oxfordshire and Wellesbourne in Warwickshire.